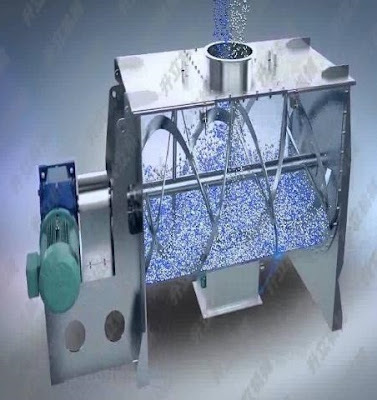 Filtration is the process of passing a liquid containing suspended matter through a suitable porous material (filtering medium) to efficiently remove the suspended matter in the liquid. This is basically a physical treatment of water. 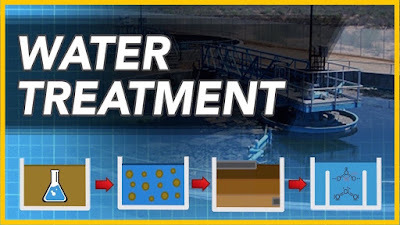 Filtration is employed in the treatment of industrial water in order to remove or reduce suspended solids and turbidity. This is of special importance in boiler feed water as otherwise there will be formation of sludge and slit deposits. These will restrict flow, causes overheating and consequent failure of water wall tubes. Furthur, in combination with hardness, these sludge and slit deposits will add to the volume and has the insulating effect of scale deposits. 1. Filtration is employed as a pre-treatment to softening or demineralising plants to protect the resins in them. It is also employed for treating potable water. 2. The weakly basic anion resins exchanges only the strong acids such as Hydrochloric acid, Sulphuric acid and Nitric acid. There are basically two types of Filters - Gravity type, and Pressure type. For industrial applications the latter are preferred; they can be linked into the mains as they work under pressure and used in conjunction with other water treating equipment like softners, demineralisers without recourse to re-pumping. Also, Presure Filters are easier to install and operate, require less space and minimal civil work. Filter media commonly employed are graded and washed sand of effective size 0.35 mm to 0.5 mm resting on supporting underbed of crushed gravel and pebble of four varying sizes, with the coarsest size at the bottom of the bed. The sand depth is 500 mm and the underbed depth also 500 mm. Backwashing of the filter bed has to be carried out periodically (normally once in 24 hours, more frequently if the pressure drop across the bed exceeds 0.7 kg/cm and which indicates accumulation of dirt in the bed) with filtered water at a minimum head of 10 MWC. If air agitation facilitates are provided then the backwash rate can be reduced. The normal backwash time is 5-6 minutes and the scour time 2-3 minutes. NormallyFilters should not be fed with water carrying suspended matter and turbidity content of more than 30 to 50 NTU. Above these limits the water should be settled and clarified before Filtration. Also to increase the efficiency of Filtration and to ensure that even fine Suspensions are removed, the ususal practice is to dose Coagulant Chemicals like alum, ferrous sulfates or sodium aluminate at the inlet to the filter by means of a effluent. Activated carbon is used as a filtering Medium when oil/chlorine removal, etc, are required. A layer of processes Manganese Dioxide is incorporated in sand filters for iron removal. A layer of anthracite once the sand bed enhances the filtering capasity by providing in-depth filtration. When anthracite is used for filter can handle turbidity of upto 100 NTU. Water occurs in nature "pure" and what ever be the source always contains impurities either in solution or in suspension. 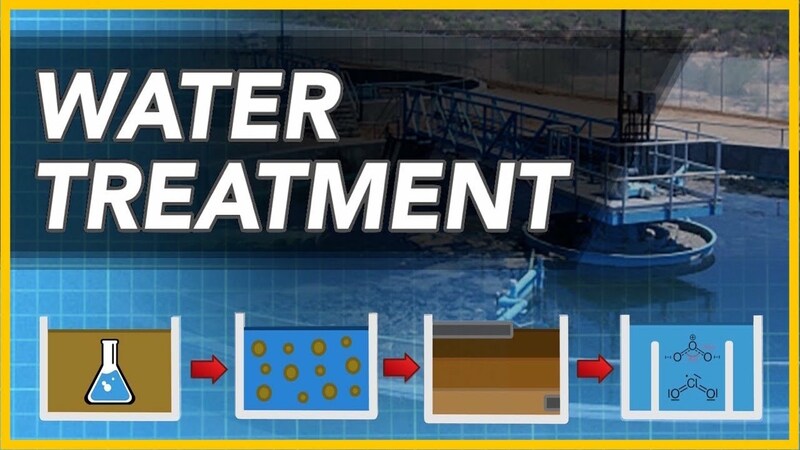 The determination of these impurities makes analysis of water necessary and removal and control of these impurities make water treatment essential. of the above, logically rain water is the purest but even this collects and dissolves atmospheric gasses and impurities in air. Further, once in contact with the earth's crust, the rain water will gradually dissolve various materials. 1) Non-ionic Impurities: These are mainly, salt, mud, dirt and other suspended matter, micro-organisms, bactiria and other organic matter, oil and corrosion products. It goes without saying that drinking water and most industrial water supplied should be clear and organic-free. 2) Ionic and dissolved Impurities: Any salt which dissolves in water disassociates into positively charged ions called "Cations" and negetively charged ions called "Anions". Since these permit the water to conduct electricity, these salts are called electrolytes. Calcium, Magnesium, Sodium and Iron, and rarely Ammonium, Potassium and Manganese. These cations are associated with Anions like Bicarbonates, Carbonates, Hydroxides (the sum of which is termed as Alkalinity), Sulfates and Chlorides. Presence of Nitrites and Phosphates is normally not very common. 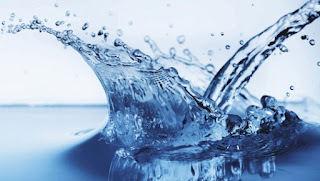 In the water treatment field, the preferred method of expression of these dissolved impurities is in terms of Equivalent Calcium Carbonate, abbrevated to as "CaCO3". This is because Calcium Carbonate is a good common denominator as it has a molecular weight of 100, which facilitates calculations. Moreover, in this form of analysis, the sum of Cations or total Cation always equals the total Anions. Quantitatively, these are expressed in parts per million or milligram/ltr. One part per million equals one ten thousandth of one percent (0.0001%). One part per million means one part in a million parts, for example, one liter in a million liters of water or one Kg in a million Kgs of water. Of all the dissolved impurities, hardness is perhaps the most troublesome. Hardness is due to compounds of Calcium and Magnesium. On heating water caontaining these salts, Carbon Dioxide is released from solution and the Bicarbonates are converted into Carbonates which are insoluble and form scales and deposites. Other salts of Calcium and Magnesium like Sulfates and Chlorides have lower solubility than Sodium salts and participated out at high temperatures. Bicarbonates of Calcium and Magnesium are known as the "Alkaline hardness" or "Temporary hardness" and chlorides, sulfates, nitrates etc., of Calcium and Magnesium are known as "Neutral" or "Permanent hardness". Sodium salts are highly soluble but can be corrosive if present in large quantities such as Sodium Chloride or Sodium Bicarbonate. Dissolved Silica is another troublesome impurity, especially in water fed to Boilers of very high temperatures and pressures. Even in lower pressure boilers, it could form a very hard type of scale by acting as a binding agent. The natural water contains solid, liquid and gaseous impurities and therefore, this water cannot be used for the generation od steam in the boilers. The impurities present in the water should be removed before it'suse in steam generation. The necessity for reducing the corrosive nature & quantity of dissolved and suspended solids in feed water has become increasingly important with the advent of high pressure, critical & supercritical boilers. -- Undissolved and suspended solid materials. -- Dissolved salts and minerals. -- Other materials (as Oil, Acid) either in mixed or unmixed forms. Turbidity in the water is suspended insoluble matter including coarse particles (mud, sediment, sand etc.,) that settle rapidly on standing. Amounts range from almost zero in most ground waters and 60,000 ppm in muddy and turbulent river water. The turbidity of feed water should not exceed 5 ppm. These materials can be removed by settling, coagulation and filtration. Their presence is undesirable because heating or evaporation produces hard stony scale deposits on the heating surface and clog the fluid system. Both are objectionable as they cause damage to the boiler system. a) Calcium and Magnesium salts: The calcium and Magnesium salts present in the water in the form of carbonates, bicarbonates, sulfates and chlorides. The presence of these salts is recognized by the hardness of water (Hardness of water is tested by soap test). The hardness of water is classified as temporary and permanent hardness. The temporary hardness is caused by the bicarbonates of calcium and magnesium and can be removed by boiling. The boiling converts the soluble bicarbonates into less soluble carbonates which can be removed by simple blow down method. The permanent hardness of the water is caused by the presence of chlorides, sulfates and nitraes of calcium and magnesium and they cannot be removed just by boiling because they form a hard scale on heating surfaces. A standard amount of measurement of hardness is taken as being the amount of Calcium Carbonate (CaCO3) in th water and is referred to in part per million (ppm) or grains per gallon (grains/gallon*17.1=ppm). b) Sodium and Potassium salts: These are extremly soluble in water and do not deposit unless highly concentrated. Their presence is troublesome as they are alkaline in nature and accelerated the corrosion. c) Chlorides: Majority of the chlorides cause increased corrosive action of water. d) Iron: Most common soluble iron in water is ferrous bicarbonate. The water cantaining ferrous bicarbonate deposits become yellowish and reddish sediments of ferric hydroxide if exposed to air. Majority of ground surface water contains less than 5 ppm but even 0.3 ppm can create trouble in feed water system by soft scale formation and accelerating the corrosion. e) Manganese: It also occurs in similar form and it is also equally troublesome. f) Silica: Most natural water contains silica from 1 to 100 ppm. Its presence is highly objectionable as it forms very hard scale in Boilers and forms insoluble deposits in turbine blades. In modern high pressure boilers its presence is reduced as low as 10-50 ppb. g) Microbiological Growth: Various growth occur in surface water (lake & river). The micro-organisms include diatoms, molds, bacterial slimes, algae, manganese & sulphate reducing bacteria and many others. These can cause coating on Heat Exchanger and clog the flow passages and reduce the heat transfer rates. h) Colour: Surface waters from swampy areas become highly colored due to decaying vegetation. Colour of feed water is objectionable as it causes foaming in Boilers and may interfere with treatment processes. It is generally removed by chlorination and absorption by activated carbon. a) Oxygen: It presents in surface water in dissolved form with variable percentage depending upon the water temperature and other solid contents in water. Its presence is highly objectionable as it corrosive to iron, zinc, brass and other minerals. It causes corrosion and pitting of water lines, boiler tubes. Its effect is furthur accelerated at high temperatures. b) Carbon Dioxide: The river water contains 50 ppm and well water contains 2 to 50 ppm of C02. It also causes the corrosion of stream, water and condensate lines, It also helps to accelerate the corrosive action of oxygen. wThe other gases are H2S, CH4, N2, and many others but their percentages are negligible, therefore, their effects are not discussed here. a) Free Mineral Acid: Usually present as Sulphuric or hydrochloric acid and causes corrosion. The presence is reduced by neutralization with alkalis. b) Oil: Generally, the lubricating oil is carried with steam into the condenser and through the feed system to the Boiler. It causes sludge, scale and foaming in Boilers. It is generally removed by strainers and baffle seperators. The effects of all the impurities present in the water are the scale formation on the different parts of the boiler system and corrosion. The scale formation reduces the heat transfer rates and clog the flow passage and endager the life of the equipments by increasing the temperature above safe limit. The corrosion phenomenon reduces the life of the plant rapidity. Therefore, it is absolutely necessary to reduce the impurities below a safe limit for the proper working of the power plant. The atmosphereic gases found in naturally occuring waters, only two Carbon Dioxide and Oxygen, are the main causes of many corrosion related problems. In this article we discusses briefly about the water treatment processes indicating the various impurities present in the water and the different types of treatment processes such as 'Filtration' and 'Demineralization', for treating the water for eliminating the suspended and dissolved impurities. RIBBON BLENDER (or) mixer machine is widely used for dry powder, Grannules, Low-viscosity paste and liquid in chemicals, food and cosmetics industries. It is particularly appropriate for combining solids and solids with liquids, Approximately two third of the volume of the container of ribbon blender is stuffed to make sure proper mixing. The Ribbon Blender can be used in either batch or continous flow form to achieve even and homogeneous blending. 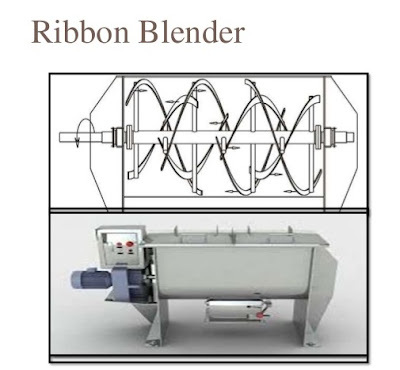 Ribbon blender consists of a "U"-shaped trough containing a double helical ribbon mixer that rotates inside. The blender's shaft is positioned within the centre of the through and has welded spokes on that helical ribbons (also referred as spirals) are welded. Since the agitator consists of a group of inner and outer hical ribbons, it is saaid as a "double" helical ribbon agitator. The gap between the ribbon's outer edge and the interwalls of the vessel ranges from 4 to 5 mm depending upon application. Generally the ribbon blender is powered by a drive system consists of motor, coupling, and gearbox. For blending 500-1000 kg of product a 10 HP to 15 HP motor is used. The agitator shaft exits the blender container at either end through the end plates secured or welded to the container. The area where the shaft exists the container is given a sealing arrangement to make sure that material doesn't travel from the container to the outside and vice-versa. The charging of material is generally done through top cover, the cover also containes cleaning and maintenance access. The material is to be blended are loaded into the blender upto 40 to 70 % of the total volume of container. This is generally up to the level of the outer ribbon;s tip. Depending upon the application the agitator is designed to operate at pheripheral speed (also called as tip speed) approx 100 mtr/min. During blending, the outer ribbons move the material from the ends to the centre while the inner ribbons move the material from centre to ends. Radial movement is achieved because of the rotational motion of the ribbons. The difference in the pheripheral speeds of the outer and inner ribbons results in axial movement of the material along the axis of the blender. As a result of cobining motions of these homogenious blending is achieved in short time. The efficiency of the blender depends on particle size, density and quantity. After blending, the material is discharged form discharge valve located at the bottom of the through. The discharge can be fitted with any kind of valve like slider gate, butter fly depending upon the material. The operation of valve can be done by manual or automatic. The motion of the ribbons near the walls can result in "pinch" points, or regions of higher shear and compression, which may damage fragile material. In some cases this can leads to friction and heat generation resulting in product degredation. An alternate design to the ribbon blender is paddle agitator, which can handle fragile material. The paddle agitator is composed of both forward and reverse paddles in place of the ribbons. The paddles are positioned to ove the material in opposing lateral direction as well as in a radial direction. The ribbon design is appropriate for low and medium duty applications, hile paddle design is suitable for heavy duty applications. In some cases we can see hybrid-design like paddle and ribbon agitator. 1) Blending large amount of dry solids. 2) Dry blending of capsule formulation. 3) Cooling, drying, heating of materials.